I would love to win with the Hot Potato Blogger Challenge because . . . I promised Maswazi and Zuki, my trusted helpers in my Toorkombuis (Magic Kitchen) that I will take them for a super steak lunch at a restaurant of their choice when I receive the prize money. And ever since I told them about the competition, Maswazi tells me he has been praying every night for me to win. In previous blog entrees I have told the story of how Maswazi, who once slept in the bushes and scavenged for food, ended up in my care and became the most amazing kitchen helper and baking assistant. Zuki has been working for me for the past fifteen years and is like family to me. Both her youngest two babies came to work with her for the first four months of their lives and everyone took turns looking after them – my mother and Maswazi included. When I started testing and developing recipes for the competition, I used them as my guinea pigs. Maswazi has an extremely sophisticated and discerning palette. Zuki loves food, but can be so picky. I know if they like a recipe it is a sure winner. When Maswazi first came to me, he did not much care for potatoes, but he slowly came around. 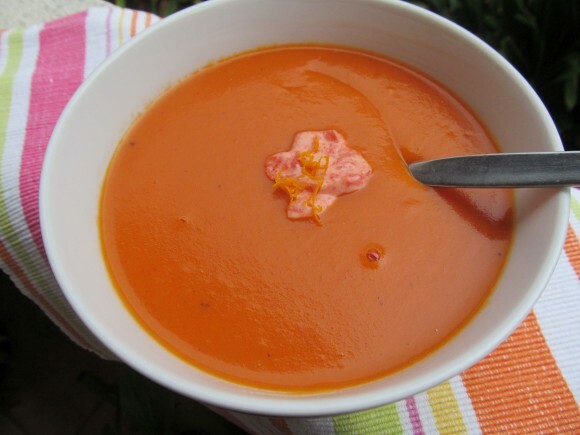 And now his two favourites soups are both made with potatoes, the curry and coconut potato soup used to be his favourite, but now this Potato and red sweet pepper soup is number one in his books. Cut the sweet peppers in half and carefully remove the stem part, white ribs and seeds. Place it skin side up on the grid of a baking tray. Brush with 2 tablespoons of the olive oil and bake for 45 minutes in a preheated oven of 200⁰C. Take the peppers out of the oven and put them in a plastic bag. Seal and keep aside until it has cooled down completely before carefully removing the charred skins. In the meantime, heat the remaining 1 tablespoon of olive oil with the butter in a heavy bottomed pot over medium heat. Add the onions, garlic and potatoes and stir well so that all the vegetable pieces are covered in the butter and oil mix. Place a piece of baking paper directly on top of the vegetables and close the pot with a lid. Let the vegetables sweat over low heat for about 15 – 20 minutes. Remove the paper, add the paprika and salt and pepper to taste. Add the sweet pepper pieces, but keep 2 – 3 of the halves aside for the garnish. Stir in the stock and let it simmer for another ten minutes before pulping the soup with a hand blender or let it cool down and pulp in the food processor. Put the soup back on the stove and heat through. Pulp the remaining sweet pepper and mix with the yoghurt. Serve the soup garnished with a blob of the sweet pepper yogurt mix and some orange zest on top. This quiche also rated highly with both Zuki and Maswazi. Start with the crust: Mix the cake flour and salt in a large mixing bowl. Add the butter and rub it with your fingertips into the flour until the mixture resembles a coarse mealie meal. Add the ice water a few drops at a time until you have a soft pliable dough. Wrap the dough in cling wrap and let it rest in the fridge for 30 minutes. Roll out on a lightly floured surface and line a 20 cm quiche pan. Cut a circle of baking paper and place on top of the dough. Cover with baking beans and bake for 13 minutes in a preheated oven of 200⁰C. Remove the paper and beans and bake uncovered for another 7 minutes. Make the filling: Drain the potatoes. Keep the skin on and cut each potato carefully in half. Melt the butter in a heavy bottomed pan and sauté the leeks with the rosemary until almost soft. Season with salt and pepper. Arrange the leeks in the pie crust with the potato halves on top. Beat the cottage cheese, sour cream and eggs until you have a smooth mixture. Add the rosemary and season with salt and pepper. Pour over the potatoes and leeks and sprinkle the cheese on top. Bake in a preheated oven of 180⁰C for 40 – 50 minutes or until the filling is set. I had my doubts about these little savoury treats. But, although Zuki and Maswazi admitted that the blueish cheese and nut combination is a bit strange to their culture, they loved it! Drain, peel and mash the potatoes. Stir in the flour and HALF of the butter. Bring together to form a soft dough and kneed well. Roll out on a floured surface until you have a rectangle that is about 0,5 cm thick. Cut squares and then small triangles. Mix the other half of the butter with the chopped walnuts and cheeses. Spread the mixture onto one triangle, leaving a small edge, cover with the other triangle and crimp the edges well. Place on a baking sheet and brush the tops with egg yolk. Bake for 5 – 20 minutes in a preheated oven of 180⁰C. Remove from the oven and brush with some more egg yolk before you sprinkle it with the finely chopped walnuts. Bake for another 5 minutes. Serve immediately.